Lesson learned: Keep it simple… but not stupid! In most areas of life you don’t get a redo. But luckily, when it comes to software all you need is time and motivation. The development effort that has gone into the ControlTier automation platform thus far has been gratifyingly leveraged by some of the largest e-commerce and SaaS providers out there. But while we were out there earning a reputation for getting the impossible done, we took our eye off the ultimate goal: To make the ControlTier automation tools useful and accessible to organizations of all sizes and complexity. Being too focused on solving the biggest and thorniest problems can lead you to forget that you also have a responsibility to make the small to medium problems trivial to handle. After all, in our field, most people’s day-to-day lives are consumed with an overwhelming amount of minor to moderate tasks. If you don’t focus equal attention on the “small stuff” you are just throwing up artificial barriers to adoption and making it more more difficult it is to reach the people you are trying to help. Ok, so lesson learned. Now what are we doing about it? The first thing we’ve done is take the distributed automation framework that provides ControlTier’s foundation and completely reworked the code to make it a standalone tool the comes with useful utilities built right in (the tool is called CTL). The second thing we did was provide users with an option to skip the environment and application modeling that was required to get going with ControlTier tools. While, yes, it is ControlTier’s modeling capabilities that make it such a powerful and flexible solution, it’s tough to get your head around it when all you want to do is plug in the framework and automate some simple tasks. With the release of CTL, users now have the option of writing standalone command modules that require no modeling. As a solution grows in complexity, scale, and variability that same user can piece-by-piece take advantage of the full modeling and context management features as appropriate. This way we’ve managed to make the “easy stuff” trivial and straightforward while still giving you the full power needed to tackle the big problems. Head to a conference like USENIX or LISA and you’ll find regularly scheduled hallway arguments over which systems management philosophy is the “right” one. Personal biases abound, but often the roots of these disagreements are simply differences in the perspectives formed through the combatants day-to-day responsibilities. One guy will care more about provisioning networks and sees a server or a storage devices as just another object on his network. Another really doesn’t care about the network and lives his day-to-day at the kernel and process level of the OS. Yet another sees the OS as an almost static thing and is consumed with managing app frameworks, databases, and code releases. Obviously, a “use the right tool for the right job” approach would be the sensible one, but the lack of definition around what the various “jobs” are pretty much kills those efforts. What you end up with is a lot of opinionated people insisting that their favorite tool is the right way of approaching any job. The good news for all of us is that some clarity to these debates may be coming from an unlikely source… the mega-companies jockeying for position in SaaS and Cloud Computing. Their contribution? Dividing up the online computing stack into well defined buckets. 1. 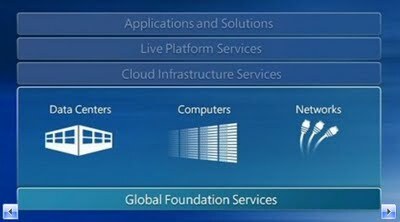 Global Foundation Services – Hardware, power, cooling, and connectivity. 2. 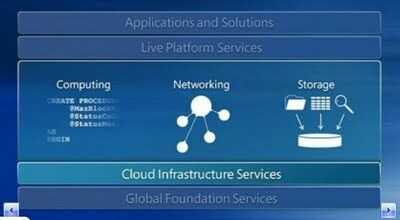 Cloud Infrastructure Services – CPU time (think EC2), storage services (think S3), and network services like routing and firewalls. 3. 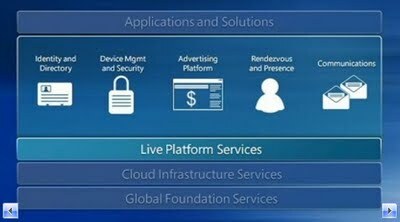 Live Platform Services – All of the various distributed application and data services that your business or consumer applications rely on and share but don’t or can’t live in any one application. 4. 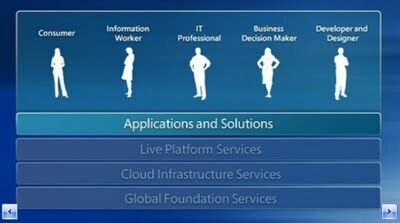 Applications and Solutions – Complete business and consumer applications delivered using the SaaS model. Of course, you can count on Google, Amazon, Yahoo (maybe), and probably SAP and Oracle weighing in with their own definitions. But the financially-backed handwriting is on the wall, the giants are going to force clear definitions one way or another. After all, they can’t sell a product you can’t name. The significance? Well it may seem small at first glance, but it’s my prediction that the definitive naming of the layers that occupy our world and the glaring spotlight provided by the media coverage these giants receive (and the budgets that come with it) will be the catalyst for period of advancement in the systems management field that hasn’t been seen the 80’s.